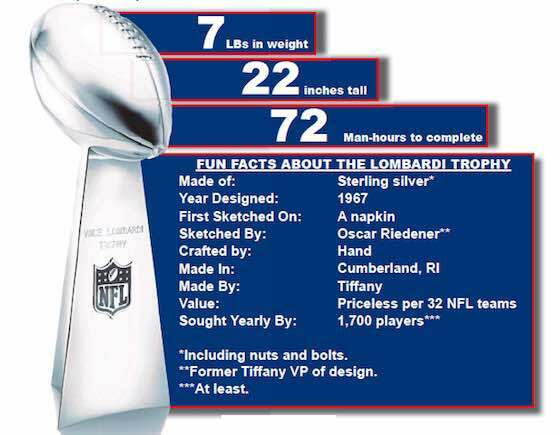 The Vince Lombardi Super Bowl Trophy is one of the most recognized trophies in all of sports. It epitomizes the pinnacle of NFL glory. Tiffany has produced the coveted trophy since the first Super Bowl in 1967. Between 1967 and 1970 the trophy was called the "World Championship Game Trophy", at a time when the Super Bowl was originally named the AFL-NFL World Championship Game. In 1970 it was renamed to the Vince Lombardi Super Bowl Trophy honoring legendary Green Bay Packers coach, who had passed away the previous September. Lombardi coached the Packers to victories in the first two Super Bowls. This sterling-silver Tiffany created trophy is nearly two feet tall and the design features a regulation-size football in kicking position. Done from scratch every year, the Vince Lombardi Super Bowl Trophy costs $50,000, takes four months and 72 man-hours to complete. The words "Vince Lombardi Trophy" and the NFL shield are engraved onto the base. Immediately following a Super Bowl victory, the winner is presented with the Vince Lombardi Trophy. After the trophy is presented, it is then returned to Tiffany for any repairs and the engraving of the Super Bowl team names and the final score onto the base. It then goes back to the winning team for permanent possession. "Tiffany & Co. creates many of the world's greatest championship trophies, and the Vince Lombardi Super Bowl trophy is certainly one of them," says VICTORIA WIRTH REYNOLDS, group director of business sales at Tiffany & Co., the trophy's manufacturer. 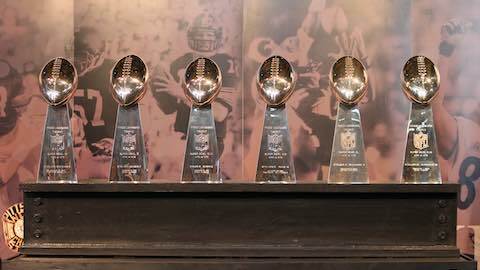 "Made by Tiffany artisans, who use age-old silversmithing techniques from the 1800's, the Vince Lombardi Trophy is a lasting tribute to the athletes' dedication and goal of greatness." Although only there have been only 49 Super Bowl winners, Tiffany has actually produced 50 trophies. The Baltimore Colts won Super Bowl V in 1971. Former Colts owner Carroll Rosenbloom managed to "borrow" the trophy a few years later for a Super Bowl party, but he never returned it. Rather than cause a stir, then NFL Commissioner Pete Rozelle orderedd that a replica Super Bowl trophy made and given to Baltimore. In 1984, when the Colts infamously moved to Indianapolis, the city of Baltimore was allowed to keep the replica trophy as part of its legal settlement with the Colts. That Super Bowl trophy is at Sports Legends Museum at Camden Yards in Baltimore. Who has won the most Vince Lombardi Super Bowl Trophies? The Pittsburgh Steelers lead the pack with 6 Super Bowl Championships, followed by the New England Patriots, San Francisco 49ers and the Dallas Cowboys with five apiece. Designed in 1967, it was first sketched on a napkin by Oscar Riedener (Tiffany's former VP of design). Sought Yearly By 1,700 players (at least). NFL Football: "Super Bowl Trophy By The Numbers"